Snack-size rusty crayfish (these ones are young - you'd want bigger ones, of course). Kelly Smith is a graduate student at Michigan State University. Here, he's catching crayfish. Kelly Smith (L) and Nick Popoff catch crayfish. Listen as we go crayfish trapping with Kelly Smith in the Red Cedar River. State officials recently updated the list of invasive species banned in Michigan. They added seven species to the list. That means you can’t have them in your possession or move them around. But they also relaxed the rules for one invasive critter: the rusty crayfish. Rusty crayfish are native to Ohio. Fishermen have spread them around Michigan by using them as bait. To learn more, I went crayfish trapping in the Red Cedar River with Kelly Smith. He's a grad student at Michigan State University. “It’s pretty nice being a graduate student and studying something that you can eat, " he says with a laugh. He’s kicking over rocks and scooping any crayfish he finds into his net. Rusty crayfish are bullies. They have bigger claws and they pull native crayfish out of burrows and leave them to be eaten. Those big claws also help them get the girls. They win mates away from the native crayfish. They take over the whole crayfish neighborhood and from there, they can reshape the food web in rivers. Now, the rules have been loosened on rusty crayfish. Nick Popoff, of the Michigan Department of Natural Resources, says people who like to trap crayfish have been asking the DNR to let them keep rusties to eat. But fishermen still can’t use rusty crayfish as bait. And you can’t move them around, except if you’re taking them home in a bucket or net to eat them. Popoff says there’s a fine line you walk when you let people harvest an invasive species. “When you start promoting harvesting an invasive species, you could be promoting its further spread.,” he says. He says if a conservation officer sees you have rusty crayfish and fishing gear, you’ll probably get fined. 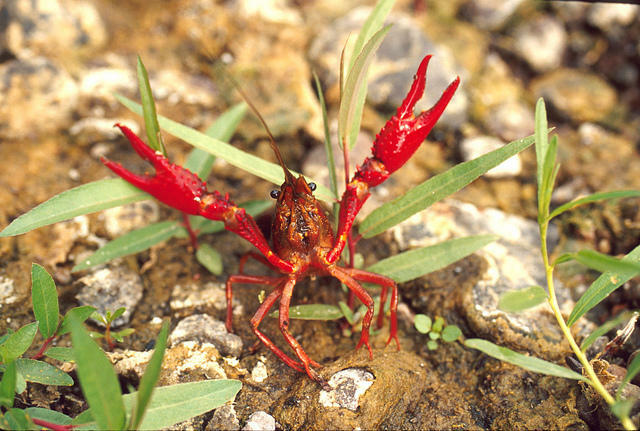 The red swamp crayfish, a Southern native, is now banned in Michigan. As a nonnative species it has invaded Japan, Hawaii and even the River Nile in Egypt. There’s another kind of crayfish state officials are concerned about. It’s called the red swamp crayfish. If you’ve ever had a "crawfish boil" down south, that’s probably what you’re eating. Nick Popoff says they haven’t found any evidence the red swamp crayfish are in the wild in Michigan yet. But he says they’ve learned fishermen are using them as bait. And the crayfish can burrow six feet into ponds and riverbanks and be hard to get rid of. So that’s why the state is now banning them. Popoff says red swamp crayfish are popular in live food markets. Teachers sometimes use them in their classrooms. And you can order them online. Now, buying and selling live red swamp crayfish is illegal in Michigan. David McGraw owns Louisiana Crawfish Company. He says they’ve been shipping live red swamp crayfish to Michigan for about 30 years. He hadn’t heard about Michigan’s new law. “It’s surprising and it’s not. We see a couple other states have done it. I would think it’s more politics, but that’s hard to say. Most people don’t respond to it well, " says McGraw. But he says they’ll just have to start shipping cooked crayfish to Michigan instead. There will be a phase-in period with the new crayfish law, but people who knowingly violate it could face fines up to $500,000. The U.S. Army Corps of Engineers is figuring out new ways to try to block two species of Asian carp — bighead and silver — from getting into Lake Michigan. The Corps also wants to block other aquatic nonnative species from getting into the Lakes from the Mississippi River system. They’re considering whether to put in new barriers near the Brandon Road Lock and Dam in the Des Plaines River near Chicago. The site is about five miles downstream from a system of electric barriers in the Chicago Ship and Sanitary Canal. Those barriers are essentially the last line of defense against Asian carp in the Chicago area. “This may be a perfect site to implement a range of different kinds of technologies," says Dave Wethington, a project manager with the Army Corps in Chicago. He says the Corps could put in barriers that block fish passage into the lock and dam, or more electric barriers. It could also put in special water guns that use pressure waves to deter carp. ALLEGAN, Mich. - Officials say genetic material of Asian carp has been found in a river in the Kalamazoo River in southwestern Michigan. The state Department of Natural Resources and the U.S. Fish and Wildlife Service on Tuesday announced DNA from silver carp was detected in one of 200 samples taken in July the Kalamazoo River in Allegan County. The river flows into Lake Michigan. Officials say the discovery marks the first time so-called environmental DNA for silver carp has been found in Michigan's Great Lakes waters outside of Maumee Bay in Lake Erie. In a statement, the agencies say there's "no evidence that a population of silver carp is established." The silver carp is one of the Asian species threatening to invade the Great Lakes and compete with native fish for food. The bass are getting fat. Lake Michigan was recently recognized as one of the best places in America to fish for bass. The booming fishery is one sign of what might be a major shift of the lake’s food web. But that change is being driven by an increase in goby, an invasive species. And it could spell trouble for salmon— the most popular sport fish in Lake Michigan.